Carl seemed excited by the attic, although Emily knew there was nothing of note up there apart from half a ton of mouldering furniture and endless boxes of books. "Great little ghost story with wit and chills." 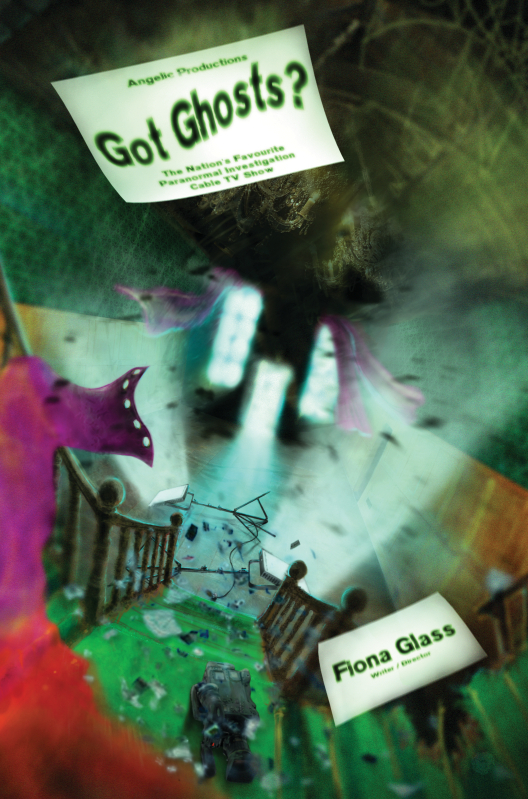 Fiona's paranormal romance novella Got Ghosts? is a quirky romp stuffed full of ghosts, TV producers, ghosts, missing paintings, happy - and unhappy - mediums, and yet more ghosts. Published by Fox Spirit. Head to the main Got Ghosts page for more info including an excerpt - and where to buy! Fiona's short story The Boyfriend From Hell was published in the Fox Pockets anthology Shapeshifters. It's a tongue-in-cheek alien romp - with tentacles - in which nobody is quite what they seems! The second of Byker Books' anthologies of "industrial strength fiction", including Rock and a Hard Place, in which an ageing rock star pretends to be gay to increase his sales, with hilarious results. The fourth volume from Byker Books includes Lemon Sour, Fiona's dark tale of childhood humiliation involving a pair of lemon yellow gloves. Featuring Jack in the Box. "The first time I clapped eyes on Frank Turnbull I was jumping naked out of the cake at his fiftieth birthday party." A prose-poem about love, inspired by the surrealist jungle gardens of Las Posas in Mexico. If you go down to the woods today you're sure of a big surprise. You may never feel the same way about tigers - or curtains! - again. A chilling tale set on a foreign beach. Sunshine, sand and sangria - but all is not quite as idyllic as it seems. What's the connection between a missing pair of curtains, the Post Office, and a nagging wife? A gruesome one! This dark, poignant story explores the effects of the modern work ethic and our divorce from nature. Fiona lives in a slate cottage within stone-throwing distance (never a good idea in Glass houses...) of England's largest lake. She rarely has her nose far from the pages of a good book - or a cup of tea! Drop in for a full list of Fiona's current books, together with some of the many short stories she's had published in anthologies and magazines over the years. Fiona lurks in various corners of the net including Facebook, Twitter and Instagram. Get all the details of where to find her here. © Fiona Glass. Header image 'Paranoid Eye' by ahermin on DeviantArt. Design: HTML5 UP.